When you think of actors, you may think first of the A-listers who appear in box office hits. But, of course, there are other actors out there too. Television actors, theater actors, commercial actors, and so on are some of them. Voice over actors are no different; there are a several different areas of voice talent, each with its own style and purpose. Instructor voices are exactly what it sounds like – these actors provide instruction on everything from corporate training to children’s educational videos. The scripts associated with this type of work are usually very straightforward, requiring an actor who can deliver informative material in a voice that is engaging and professional without being stiff. Confident, charismatic, and self-assured are a few words that would describe a spokesperson voice. Spokespeople are responsible for selling products, services, and even causes. As such, they need to sound intelligent and believable, and they must be able to present the material with some authority. “Real person” voices invoke feelings of trust and friendship. These roles require a voice that is more natural-sounding, like what you would use in conversation with a friendly neighbor. There should be a bit of familiarity, as these voices are meant to be interpreted as more intimate than an instructor or spokesperson. Narrators are essentially storytellers, so being engaging is an absolute must. Sometimes there is a visual piece accompanying the audio component that a narrator provides, but that is not always the case. In these instances, it is more important than ever to give listeners a complete picture. 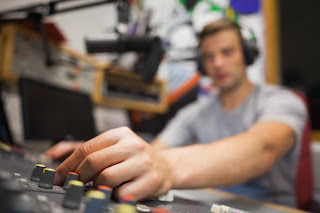 Narrators must be able to turn a script into a nuanced story, giving it a richness and allowing listeners to connect on an emotional level. Anyone that’s ever listened to the radio or watched a sporting event on TV is familiar with the announcer style of voice over. Announcer voices are confident and assertive, able to introduce ideas with ease and deliver a call for action at just the right moment.